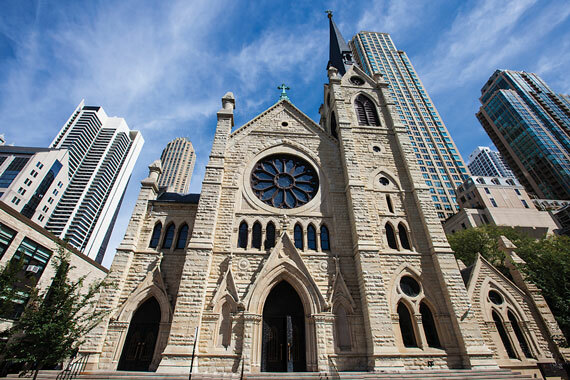 November 21, 1875 – Holy Name Cathedral at the corner of Superior and State Streets is dedicated. William Ogden and Walter Loomis Newberry donated the site on which the cathedral stands in 1846 and a small church was built in 1848. In 1853 a more impressive building was begun, but it was still unfinished when it was consumed in the 1871 fire. The new cathedral was begun in 1873 while the congregation worshipped at the corner of Chicago Avenue and Cass Street. One noteworthy aspect of the dedication pertains to the music chosen that was heralded as something that would begin “a revolution in Catholic church-music in Chicago . . . the first fair illustration in this city of the new school of music . . . [to] prohibit operatic and dramatic music in the church . . . to assist, instead of distracting, devotion.” The choir includes only 25 voices and the orchestra only 25 instruments. The Rt.-Rev. P. J. Ryan, Coadjutor Bishop of St. Louis, preaches the Dedication Day sermon before a congregation of 3,000 congregants. November 30, 1951 -- U-505 on the Way to Chicago?